The motorhomes created by the Klaus Hünerkopf - Die Premium-Manufaktur company are genuine works of art. Specialised in high quality furniture, as well as fittings for shops, hotels and restaurants, every Premium-Manufaktur motorhome is furnished with exquisitely prestigious style. Absolutely nothing is prefabricated. These luxurious masterpieces are decorated with a level of superior quality that reflects the individual, and sometimes unusual desires of a wide range of customers. The Premium-Manufaktur company in Neukirchen is a byword for innovative ideas, ultimate precision and high-quality materials and processes. Regardless of the producer and the size of the vehicle, every Premium-Manufaktur motorhome is designed to meet the living requirements of a vast range of customers and all classes of vehicles. This means that every home, whether the company has renovated, modernised or built it from scratch, is always constructed with painstaking care and the highest level of expert craftsmanship. The company offers other services, too, including repairs and an accident assistance. This is why, in addition to the company’s core carpentry division and its state-of-the-art CAD/CAM machines, it also has departments specialised in water jet cutting, fine stonework, painting, upholstery, ironwork, electronics and electrical engineering, metal construction and a prototype production area. 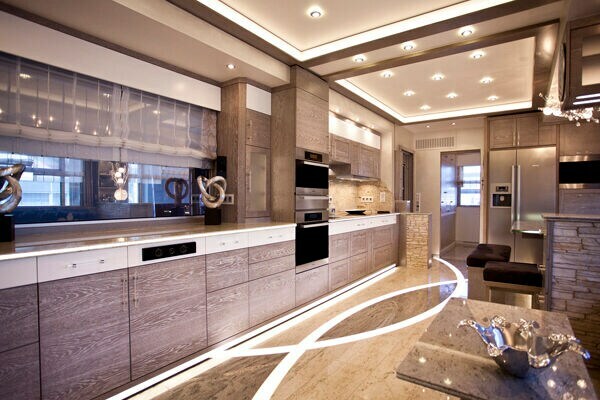 Plus, of course, creative design and architecture, which are the owner’s special loves. In addition to this, the company satisfies a vast range of worldwide customer target groups. Premium-Manufaktur places particular value on its customers that it contacts through classic Motor Show appearances and more directly at the Camper Park in Urbachtal, which also belongs to Klaus Hünerkopf. Being located so close to the park allows owners to either leave their motorhome with the company for brief periods so it can be repaired, renovated or modernised, or have a totally new one built. This is why guests from all over the world often choose to create their dream motorhome when they are here. The power of sector operators’ “word of mouth” is another factor in the company’s success that should not be underestimated. The open-minded, friendly and sociable mentality of the people who travel in motorhomes also creates the ideal atmosphere for raising awareness of the brand nationwide. "We thrive on emotions," comments Klaus Hünerkopf, who, in 1989, took over Premium-Manufaktur, a company originally founded in 1955, and stamped his character on it, by turning it into a manufacturer in the MB Zetros Camper, esterno PREMIUM MANUFAKTUR - GERMANY 87 true sense of the word. Klaus is also active within the company all the time, constantly tinkering with something new and indulging his love for fine wood panelling. Just a glance is enough for any customer to see the importance that Klaus places on these prestige finishes, as they are everywhere, in the real wood veneer of the curved front cladding, the veneered doors with their fine glass inserts, the lighting elements, the real wood veneer and glass floors and the rounded partitions, with their fine veneered surfaces. Klaus Hünerkopf elaborates: "The original style of these motorhomes is created by our special veneering process that uses only one tree trunk for each vehicle. So, thanks to our insistence on superior hand craftsmanship, every motorhome is unique. The curves in the dividing walls or on the fronts of the furnishings are all clad with a continuous veneer that has a very special style. The panelling is also arranged so the veneer has a consistent progression from the bedroom to the lounge. You can literally see the grain of the trunk repeated in sequence. The woods we particularly like are teak, oak, cherry, walnut, birds-eye maple, tineo and maple, as well as any special customer requests. This means it may take us several months to finish a motorhome." For the furnishings and fittings the company makes for shops, hotels and restaurants and "Interior furniture, mass product installation, individuality, quality, customer-oriented solutions and styles – all the key priorities in our company sectors are focused on these criteria. Satisfying the desires of our customers, discovering new technical solutions and setting trends with unique designs, these are the key data that determine the philosophy and success of the Klaus Hünerkopf - die Premium-Manufaktur company" Klaus Hünerkopf motorhomes, in particular, two work stations now play a leading role in the company’s pool of modern and perfectly maintained machines: the 5-axis CNC work centre (morbidelli author x 5 evolution), and a wide-band sanding machine with a fine-sanding and electronic sanding unit (dmc sd 90). In the case of the work centre, both the 26-drillhole boring head and the controlled five axes guarantee maximum efficiency for solid wood and panel material processing. The axes change position continually from the vertical to the horizontal position as well as rotating by 360°. To machine all the possible sides of a piece economically, all the sides, the various tools, such as cutters, drills, sawblades, and so on, are replaced automatically by the tool magazine as they are needed. So, any kind of CNC part can be machining, as well as individual moulded pieces or 3D parts with an infinite range of processing variants. Without doubt, the wide-band sander has become the company’s bread-and-butter machine. Its all-in-one design means it has a wide range of uses, from the precise calibration of the load-bearing plates to the preparation of surfaces for painting and intermediate sanding and onto fine veneer-sanding. To ensure that this range of functions is easy to manage - as a sanded surface can often be very expensive for this kind of product - the machine’s intuitive controls have an innovative graphic interface. All the machining parameters are entered and activated simply by pressing a button. Work programs that are regularly repeated can also be saved and recalled when required. 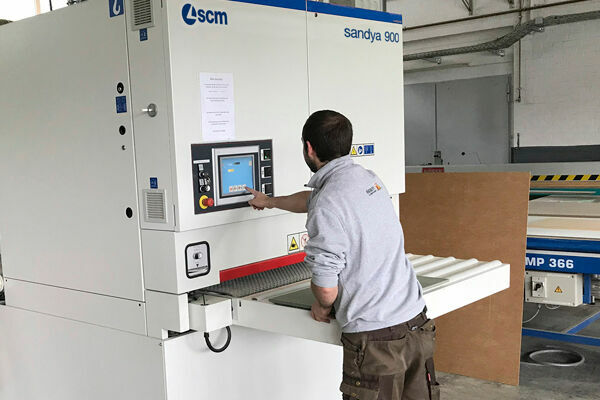 Both an expert and a realist, Klaus Hünerkopf comments: "Thanks to the dmc sd 90 wideband sanding machine, the need to square pieces during machining has dropped to zero per cent, which is a clear financial advantage. This becomes particularly clear if you take into consideration that when preparing veneers for a motorhome, if you have to square a sliding door, you also have to reconstruct the adjacent walls. The dmc sd 90 wide-band sanding machine allows a finished surface to be sanded in tenths of a second. When combined with the veneer saw and the jointing unit, in principle we can produce finished furniture surfaces with the highest level of precision – there is no better quality in the world”.